The West Highland white terrier, commonly called a "Westie," is a small, energetic dog with a lively and lovable personality. The Westie is very loyal and smart but also possesses an independent spirit. Though quite compact, the Westie is not dainty or overly muscular. The Westie's upbeat and lovable personality makes it a wonderful companion. Both active and cuddly, the Westie is versatile and adaptable, making the breed a great fit in most households. This compact breed is joyful and loyal. With appropriate training and socialization, Westies can get along well with children and can generally fit in with all types of households. In addition, this small dog breed is typically suitable for apartment living. The West Highland white terrier hails from Poltalloch, Scotland and dates back well over a century. It's believed that all of the terriers of Scotland came from the same lineage, including the Scotties, Cairns, Dandie Dinmonts, and Westies. Westies were used to hunt vermin as well as provide companionship. The inspiration for breeding a white terrier is said to come from Malcolm, Laird of Poltalloch, who noted that his red terrier looked too much like a fox when hunting. After a tragic accident, he determined to breed a white terrier. Once known as the Poltalloch terrier or Roseneath terrier, the breed has been in the US since the early 1900s. It was recognized by the American Kennel Club (AKC) in 1908. The advertising for Cesar dog food features a West Highland white terrier, as does that for the Black & White Scotch whisky. The Westie is completely white with medium-length hair. The top coat is coarse, stiff and dry while the undercoat is soft and fine. Westies require routine grooming, generally on a weekly basis. Brush or hand-strip (pluck dead hairs) your Westie at least once a week. You may also wish to have your Westie trimmed by a groomer from time to time (generally every four to six weeks). Fortunately, Westies shed very little. Regular nail trims are also important in order to keep your Westie's feet healthy and comfortable. As true terriers, Westies are naturally curious and alert. They can be considered lively but not highly energetic, so routine moderate exercise should be enough to keep them happy and healthy. Daily walks are generally enough to fulfill the Westie's exercise needs. However, every dog is different. If your Westie seems restless or bored, begins acting out, or becomes overweight, you may need to increase the exercise you provide. It is important to keep a Westie on a leash for walks as they have a high prey drive and will run after anything that moves. Keep that in mind when providing a fenced outdoor area as well. Westies are best kept indoors when you are away from home and they do well with crate training. They are fairly low-energy indoors. Terriers are generally smart dogs that enjoy learning and crave structure. The Westie is intelligent and motivated, so proper training is highly beneficial as well as necessary. A well-trained and socialized Westie is more likely to stay focused on you and be well-behaved in public places (and will, therefore, be more welcome). 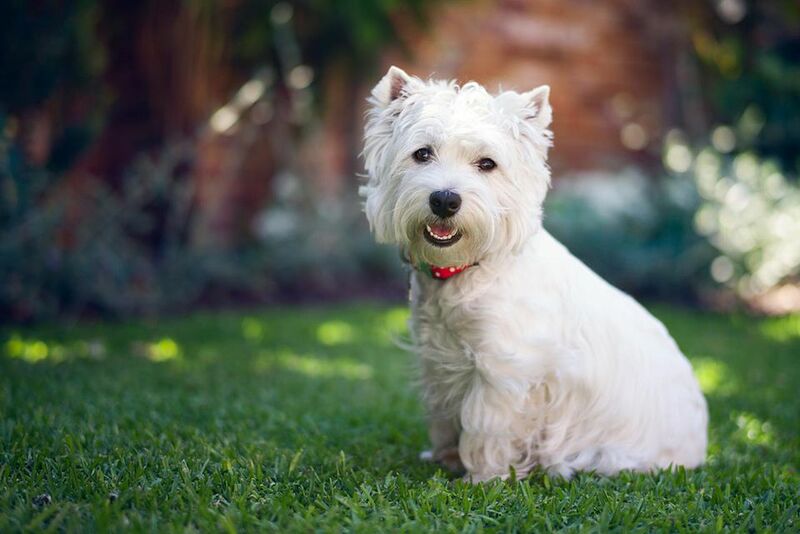 Westies do well in multiple-pet households and will usually get along well with other dogs and can adapt to cats. But a Westie will naturally pursue small animals such as gerbils and guinea pigs, so you will need to keep any such pets separate from a Westie. Compared with many small dogs, a Westie does better with you being away from home during the workday without separation anxiety. They are not typically a lap dog but want to be monitoring the area and playing games. Terriers often like to dig, which can be a problem for your garden and potted plants. You can train your Westie not to dig by being consistent in redirecting him from an early age. Barking can be a problem as your Westie will alert you to every passerby and moving bug. If you are diligent, you can train them to just bark once. Responsible breeders strive to maintain the highest breed standards as established by kennel clubs like the AKC. Dogs bred by these standards are less likely to inherit health conditions. However, some hereditary health problems can occur in the breed. Westie jaw, or craniomandibular osteopathy, is caused by a recessive gene and leads to problems in chewing and swallowing. Some cases are able to be treated with anti-inflammatory medications but others are too severe and painful. Westies are best fed two meals a day for a total of 1/2 to 1 1/2 cups of dry food, depending on their size and activity level. Always make sure that they have clean, fresh water for drinking. Be sure to monitor your dog for weight gain to prevent obesity. Diet needs, including the amount and frequency you feed them, will change over time as they age. Work with your veterinarian to figure out an individualized diet plan for your dog. As with any breed, if you think the West Highland white terrier is right for you, be sure to do plenty of research before obtaining one. Talk to veterinarians, pet professionals, other Westie owners, reputable breeders, and Westie rescue groups to learn more. There’s a whole world of dog breeds out there for you to research to find the right one.